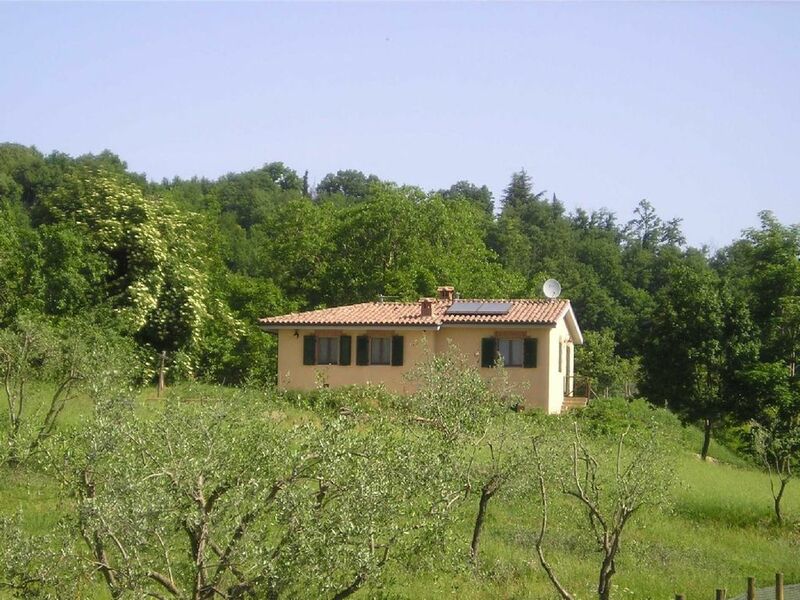 Your Summer holiday rental in a tranquil country and romantic place, where you can watch birds, deers and wild boars. The cottage, completely independent and self-catering, has been recently rebuilt with energy saving criteria. We are located one hour driving from city of art: Siena, Florence, San Gimignano, Volterra, Monteriggioni, San Galgano, the Etruscan Sites of Populonia and the Tyrrhenian seaside. An ideal location to recharge ones energy away from the strain of daily life. Unforgettable walks with romantic view can be arranged in the Natural State Reserve of Cornocchia, just a few minutes walk from the house. My husband and I came from Milan to this wonderful area of Tuscany in 1996. We have been enchanted by the quietness and brightness of the surrounding nature, the silence of the nights, the wildlife around with deer and a lot of different birds. In addition Tuscan food is so delicious and full of flavor! In a short time we can reach the cities of art or the sea side, enjoying other areas within Tuscany. The owners are lovely people and the cottage is clean. The views from the terrace over the Tuscan countryside are divine. Wirhin easy reach of Florence Sienna Pisa and Voltera although a car is a must. If you like peace and quiet then this is the place. We had a fantastic week at Mario and MariaPia's property. It was unbelievably peaceful and the view from the terrace is just so calming and beautiful. House is spacious and very clean with everything you would need. Great location with lots to see and do within 1.5 hrs drive. It really is a superb landscape and we loved driving around as every road has stunning views. Mario and MariaPia were just so hospitable and welcoming. They were also very helpful in giving advice on things to do and how to get there. It was a treat to have met them, so nice. We would not hesitate to go back, beautiful! Just a terrific place to stay if you want peace and solitude along the way! The property was outstanding! Very well maintained in all areas. Anna Pita and Mario are excellent hosts. Both offered local recommendations that exceeded our expectations. Great experience, it's very understandable why their past reviews are so good. Just great people! This is the third time in four years that we have stayed here. We love the place so much. Maria Pia and Mario (the owners) are like old friends now. We are made to feel so welcome it is a real drag to leave at the end of the stay. There are many places to visit in the area and this year we found a hidden gem near to Colle di Val d'Elsa - a Roman Etrusian baths just off the main road. We also saw lots of wildlife, the highlights being Short Toed Snake Eagles, deer in the garden and on the last day a Pine Marten in the apple tree next to the outdoor sitting area. We will definitely return again. Über eine kurze unbefestige Straße erreicht man das gut ausgestattete Ferienhäuschen unterhalb des Örtchens Belforte. Die Vermieter, Maria Pia und Mario, wohnen gleich nebenan in einem separaten Haus. Sie sind sehr liebenswürdig und sprechen sehr gut Englisch. An Ausstattung haben wir nichts vermisst (anstatt Kaffeemaschine gibt es einen ital. Kaffeekocher). Es war sehr ordentlich und sauber. Die Fenster haben Gaze und Fensterläden, so dass es auch im Juli auszuhalten ist. Die Lage in der Südtoskana ist zentral; Florenz, Siena, Maremma, das Meer und viele sehenswerte Dörfer und Städtchen sind mit dem Auto gut erreichbar. Great afternoons - in the afternoon you are welcomed by cats and their owners Maria Pia and Mario: you get a friendly knock on the door and they make sure you've got everything you need: from flowers in and outside the house to maps and information about the neighbourhood. And... lovely evenings - the evenings are cosy and quiet: the sound and warmth of the fireplace makes you feel happy and long for more Italian experiences. Il Casino is a cottage 300 m. from the typical village of Belforte, which was originally built around the year 1000 as a fortified castle on the top of a hill. Here you can find a bar, a restaurant, a post office opened 3 days per week and a little shop. It is an ideal place for a relaxing holiday and near the main towns of art and culture of Florence, Siena, Volterra, San Gimignano, Massa Marittima, not to mention the wonderful central Tuscany seaside, all within 1 hours drive. Only 7 km away you can visit the medieval village of Radicondoli, where you can find bars, groceries, the butcher, the chemist, a bank, a post office, a doctor, a hairdresser, the tourist office and an Internet point. Furthermore some typical little restaurants invite you to taste their home-made Tuscan recipes and, of course, the wonderful Italian pizza. Other Activities: birdwatching, wildlife watching. All rates include electricity, water cost and final cleaning. WIFI Internet available at no additional charge. Heating, if needed, will be charged by usage through a gas meter reading (max € 5 per day).